Why Should You Choose Rust911? - Rust911, Inc.
Our rust removal technology was created by the best chemical engineers. It was created to remove rust effectively without harming the environment! 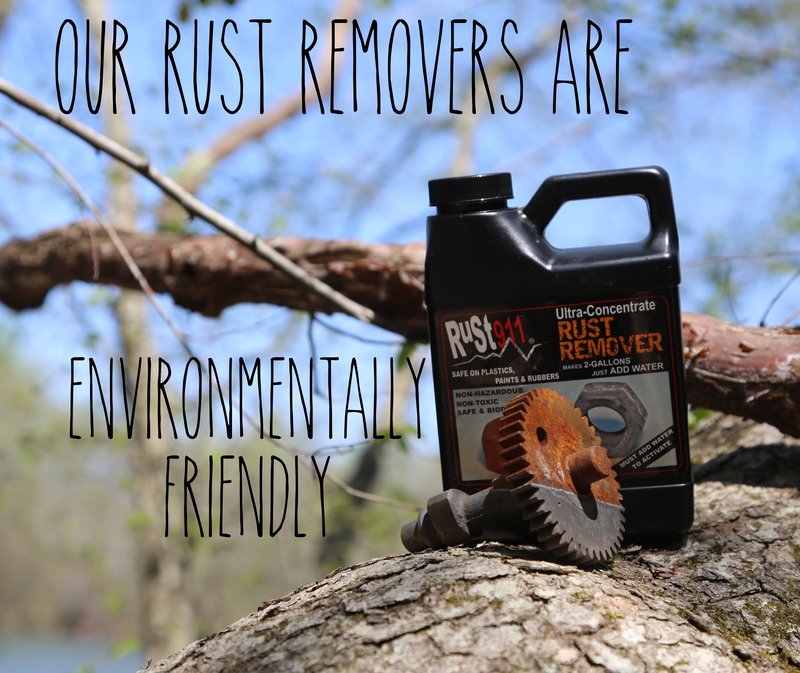 Our rust removers are non-toxic, non-hazardous and biodegradable. Rust911 rust removers have a neutral pH, we do NOT use acids to remove rust! Rust911 is available in a concentrated form. The concentrate mixes easily with tap water. Once the water is added, the solution is activated and ready to tackle stubborn rust! Our concentrated solution reduces the total cost, shipping cost and the amount of space it takes on your shelf. Rust911 rust removers attack RUST and only rust. They do not harm paints, rubbers or plastics. That means, you can fully submerge your rusty items in our solution without worrying about the rust remover causing harm to anything except the rust. Our rust remover is extremely easy and safe to use. We offer a RTU (ready-to-use) solution that is already diluted. The RTU rust remover can be poured directly into a bucket to remove rust without diluting the solution! The Ultra-Concentrated solution mixes easily with water (8 ounces for 1-gallon of solution) and then the solution is ready to use! Rust911 rust removers can be used over and over again until the solution turns black (this means the solution is fully saturated with rust). Once your project for the day is one, just bottle the used solution in an unused, air tight container and store it on your shelf for up to 9 months. Our rust remover can be used with two different application methods: immersion or continuous spray method. Immersion means to completely submerge the rusty item in the rust remover. The continuous spray method can be done several ways, but the most common is by using a parts washer. The continuous spray method can also be done by using a pump system with a hose and sprayer. There are a lot of reasons to choose Rust911! If you would like more information, visit the FAQ's part of our website, call 828-446-9809 or email info@rust911.com.